Bestselling author and unorthodox matchmaker Hellen Chen in her latest new book "Hellen Chen's Love Seminar: the Missing Manual that will Make Your Relationship Last" reveals the pitfalls of modern dating and how to find and create lasting relationships. If hardworking individuals could spend part of their time to take care of love matters like marriage, they will do so much better in all aspects - career, personal development and having a family future to look forward to. "If you are just dating with no intention of getting married with your partner, you are simply taking care of someone else' s future spouse," wrote bestselling author Hellen Chen in her latest new book, Hellen Chen's Love Seminar: the Missing Manual that will Make Your Relationship Last. According to Chen, whose marriage philosophies have been quoted in over 200 media publications in 18 countries, over 85% of dating ends up in breakups. "There are only 2 endings to a relationship: marriage or breakups. If there is no intention to get married in the first place, most singles are simply wasting their time. Over some time, the flaws of their dating partners will only get magnified and the relationship will break," said Chen in a recent Los Angeles seminar she was giving to singles who come to her wanting to find "perfect matches." Chen noted the worldwide phenomenon of delayed marriages and yet increased divorces. She mentioned in a recent radio interview that "increased dating time to know a person did not increase the longevity of marriages in America." "The solution to reducing the high divorce rate is not delaying marriage but increasing one's knowledge on how to manage a sound relationship," Chen commented. According to a new report by the University of Virginia National Marriage Project, Americans are postponing marriage to their late twenties and thirties for two main reasons, one economic and the other cultural. The report also mentioned that young adults have come to see marriage as a “capstone” rather than a “cornerstone”— something they do after they have all their other ducks in a row, rather than a foundation for launching into adulthood and parenthood. "The main problem with wanting to wait until career and financial statuses are established is age. I get approached by many singles who are in their late 30s and 40s and even 50s. They are stable in their career and have the money. But they could not find a suitable match and many of them would like to have children. Many of them have missed the golden time of finding their matches," said Chen. Alice H, a media executive who has sought Chen's help, is a typical example of a highly successful professional. She has been a dedicated worker in her career and has gone in and out of dating relationships. Now reaching 40, she would like to get married and have children. However, despite good looks and financial stability, she never thinks she would end up not having any prospects. An established dentist Dr. Ken approached Chen for finding a match. He would like to get married and have children. The only one strike against him however: he is in his 50s. The eligible women who would fall in love with this quiet and shy doctor would have to be 10 years or more younger than him to bear children. "Most people forget the 'age factor' in the game of seeking marriage," said Chen. "When someone say 'I do,' that power of commitment is great. " Chen said. "If hardworking individuals could spend part of their time to take care of love matters like marriage, they will do so much better in all aspects - career, personal development and having a family future to look forward to." Even for divorcees who had stepped back into marriage again, Chen witnessed that simply by having the marriage foundation again drove them positively in their careers. Chen's new book on helping singles and married couples to make their relationship last will be launched at Barnes and Noble officially on Oct 30th, Wednesday. 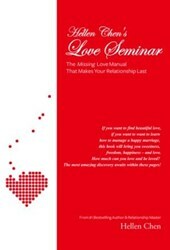 More details are located at her site: http://matchmakerofthecentury.com/books/hellen-chens-love-seminar-book/.